Technology, tourism, politics, and law have connected human beings around the world more closely than ever before, but this closeness has, paradoxically, given rise to fear, distrust, and misunderstanding between nation-states and religions. In light of the tensions and conflicts that arise from these complex relationships, many search for ways to find peace and understanding through a "global public sphere." There citizens can deliberate on issues of worldwide concern. Their voices can be heard by institutions able to translate public opinion into public policy that embraces more than simply the interests and ideas of the wealthy and the empowered. Contributors to this volume address various aspects of this challenge within the context of Baha'i thought and practice, whose goal is to lay the foundations for a new world civilization that harmonizes the spiritual and material aspects of human existence. Baha'i teachings view religion as a source of enduring insight that can enable humanity to repair and transcend patterns of disunity, to foster justice within the structures of society, and to advance the cause of peace. Accordingly, religion can and ought to play a role in the broader project of creating a pattern of public discourse capable of supporting humanity's transition to the next stage in its collective development. The essays in this book make novel contributions to the growing literature on post-secularism and on religion and the public sphere. 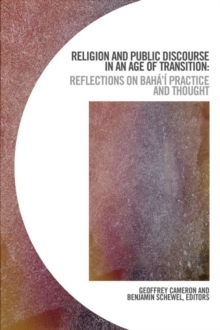 The authors additionally present new areas of inquiry for future research on the Baha'i faith.